oooh, that's gorgeous! bright and girly! love the transparency flourishy thing and the letters... want some of them! WOW!!! I love this LO, every bit! I have been slightly overwhelmed by these pps but you have shown how good they can look, especially in smaller amounts like you have used. Lovely! Great kit btw Tania! Lovely selection! Love how fresh this looks, great photo & love the green flowers. Wow, Kim! That is just gorgeous!!! Of course you had a beautiful subject to work with and the pps are just right! Love your button flower centres, too!! Oh tania, you chose such awesome things for Kim to work with. Kim, you've created such a beautiful page out of your kit! This is just lovely. Wow what a stunning layout this is, and well done Tania for putting together such a gorgeous kit! 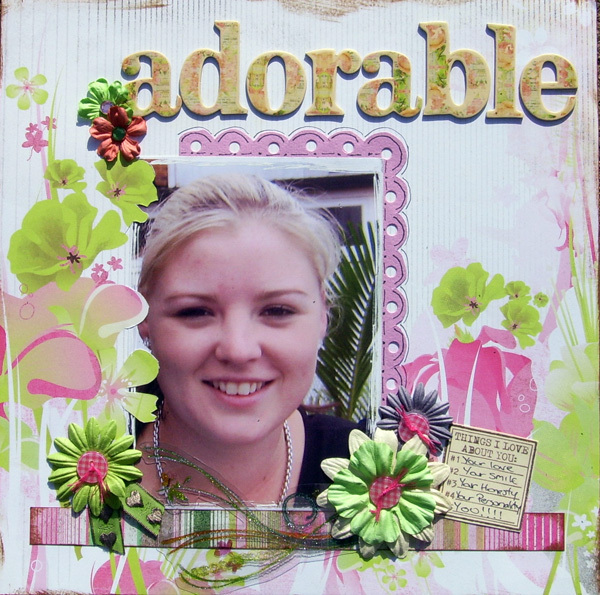 Kim this just jumped out as a thumbnail.. it is so pretty.. and what a magnificent pack to work from! Kim, this is glorious. You've used that pp to perfection! I love that glittery flourish and the alpha looks wonderful too. Gorgeous Kim, love the new transparency and that pp is gorgeous, but then its BG! You've used Tania's kit of fresh and vibrant colours very effectively, Kim. It's a lovely LO. This is gorgeous, love the pps and the flowers look terrific.